This week leading up to the New Years on Lake Okeechobee has been fantastic. The water temp is in the 70’s and the wind has been light from the NE. 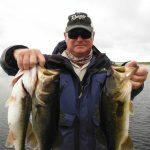 You can catch fish anyway you like now; topwater, swimbaits and crankbaits have been good. This week I have been doing a lot of guiding with shiners and have been catching 30 or so fish in my 4 hour trips. On my off time I have been flipping a Gambler BB Cricket in the mats. Here is a picture of some of the fish I caught this week.